Performance testing is one of the major aspect of Web and Mobile application testing since it effects customer satisfaction and business revenue directly. 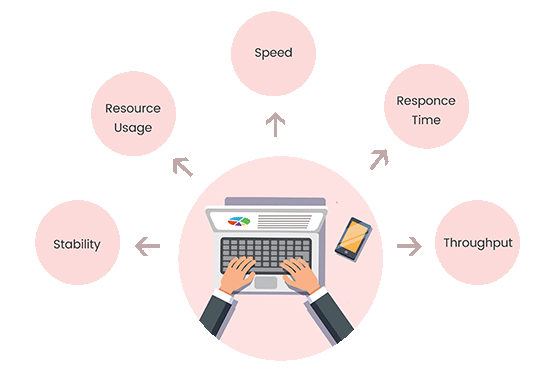 In our Performance testing service, we try to find out the responsiveness, throughput, reliability and scalability of your web and Mobile application under normal load and in stress condition at each stage of SDLC and before going to production. Performance issues or the lack thereof can make or break your application. When competition in the market is as intense as it is these days, you cannot afford such issues. So, how do you ensure that your application performs reliably and well at each stage of interaction? This is where Testrig Technologies comes in. We offer you performance testing services as well as performance test, website load test that test your app or website under normal load conditions as well as peak conditions. The services test for speed, resource usage, stability, response time and throughput. There are number of tools are helpful for performance testing but jMeter is one of the best tool which is used for performance testing. It can conduct performance testing over any platform. JMeter Testing is best for load and stress testing. It is automated and time-saving. Recording of test sessions is an easy task. It has the unique ability of being a very user-friendly graphic interface. Whether it is desktop, cloud, mobile, web or analytics, we can test the performance of your app over many different platforms and domains. We can help make your dream of ruling the market with your app come true.